Fair Trade is a term you are beginning to see much more as the eco-friendly movement grows. Fair Trade Designs embodies this ideal with their great sustainable items, each with their own background story of the artisans who create them. 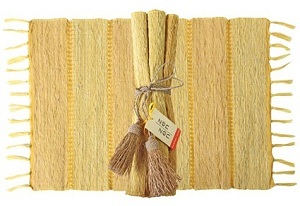 Vetiver Root Place Mats – Hand woven from cotton and vetiver root and tied together with vetiver tassels. Vetiver is a fragrant easily renewable and naturally aromatic root indigenous to India and Indonesia. The soothing, herbal scent covers kitchen smells and also makes great drawer liners. Because of its deep growing & tightly meshed root system, vetiver is also used by conservation and community development projects to stop erosion in deforested areas. The mats are hand made in a fair trade village cooperative in Java, Indonesia. This product comes from Zen-Zen, a Fair Trade Federation member. That means everyone they employ, including their subcontractors, gets a fair living wage and has good working conditions. Their Indonesian employees also have health insurance, a pension plan and organized Friday afternoon sports. Additionally Zen-Zen utilizes, sustains, supports and promotes traditional, indigenous village handicrafts, so they can be enjoyed by this and future generations. Everything is hand-made by village artisans or in their Balizen in-house, fair trade workshop with the smallest carbon footprint they can manage. Lokta Bush Journal – Completely tree-free, the journal is made entirely from the lokta bush, a plant native to the Himalayan Mountains. It’s easily renewable and makes a beautiful and sturdy writing surface. 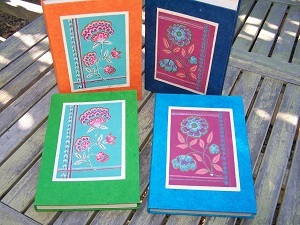 This handmade paper product is part of a paper project initiated by UNICEF. It uses traditional Nepali paper to create products for western markets. Nepali’s have been producing handmade paper in their villages for over a thousand years and still use it in their daily lives. The paper, made from the bark of the Daphne or “lokta”, is renowned for its exceptional durability and wonderful texture. The goal of the paper project is to help low income rural and urban families earn a fair and equitable income while sustaining the important traditional craft of paper making. The project leaders are committed to community development and invest a substantial percentage of their profits in community-based projects including water supply, sanitation, resource conservation, education and day care facilities. 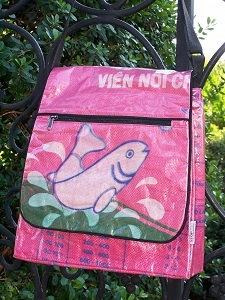 Recycled Rice Messenger Bags – Made from recycled rice and feed bags inside and out. Very roomy inside, with a zippered pocket and 2 pockets for phone and keys beneath the front flap. Flap also has a large zippered pocket. Interior closes with a full-length zipper. Clear vinyl covers the recycled fabric for protection and easy cleaning. Handmade in Cambodia by women who’ve been rescued from human trafficking. This bag was made under the auspices of StopStart, an international relief organization that provides shelter, education, and jobs for trafficked and abused women in Cambodia. The organization employs about 40 women, many of whom have been rescued out of sexual trafficking. Whether trafficked or not these women have suffered extreme emotional or physical abuse.